Hi, I always get "Unable to reach our server" when trying to save a password. Not sure why. I have internet connection. @sfy: Thanks for reaching out. I’m sorry for the trouble! Honestly, I can't say I'm sure either, other than that, if you are in fact online, something else is interfering with 1Password X connecting to 1Password.com. Do you perhaps have "security" software that is messing with your certificate store, or other extensions or settings that are blocking the connection? Do you perhaps have "security" software that is messing with your certificate store, or other extensions or settings that are blocking the connection? 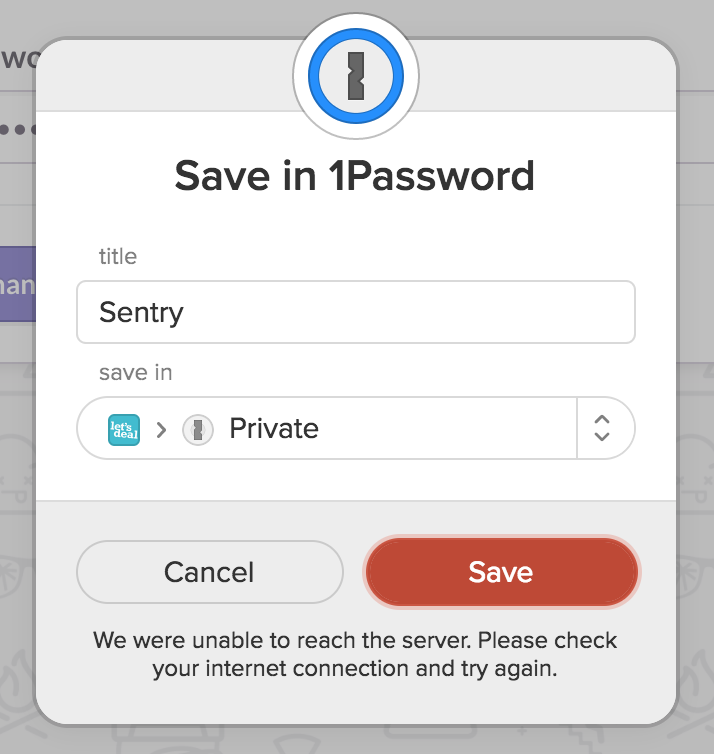 Anything preventing 1Password X from connecting to the server securely will cause an error like that. And if you're not having trouble more generally, like a proxy, it's probably something you've setup within Chrome itself. Let me know what you find! It's not straightforward to update to Chromium 66, since that's not packaged in Ubuntu at the moment, only version 65 is. However, at some point since I reported this problem here, the 1Password X extension automatically updated to 1.7.0 (previously it was at 1.6.0) and this problem isn't happening any more, so I'm happy with that. Sure thing! Thanks for letting me know. When there's a new version of Chrome available we commence testing against that though, so running the current version will always be best since any changes we make in 1Password X will be targeting that. Cheers! I should mention that this happens a lot to me too. This does not necessarily happen for all the websites though. I am able to save new passwords and use 1Password for filling passwords for most the websites, but a few like Stack Overflow do not work. It shows the error mentioned by the previous users. I don't remember other websites this happens for, at the moment. Although, it's worth noting that I have Little Snitch 3 application working on my MacBook Pro all the time. I have set this tool to allow most of the connection requests though. @arunsathiya: I think that's probably a different issue if it's only happening at some websites (the original poster says "I always get "Unable to reach our server" when trying to save a password"). And honestly I'm having trouble imagining why it would happen to you at some websites but not others. 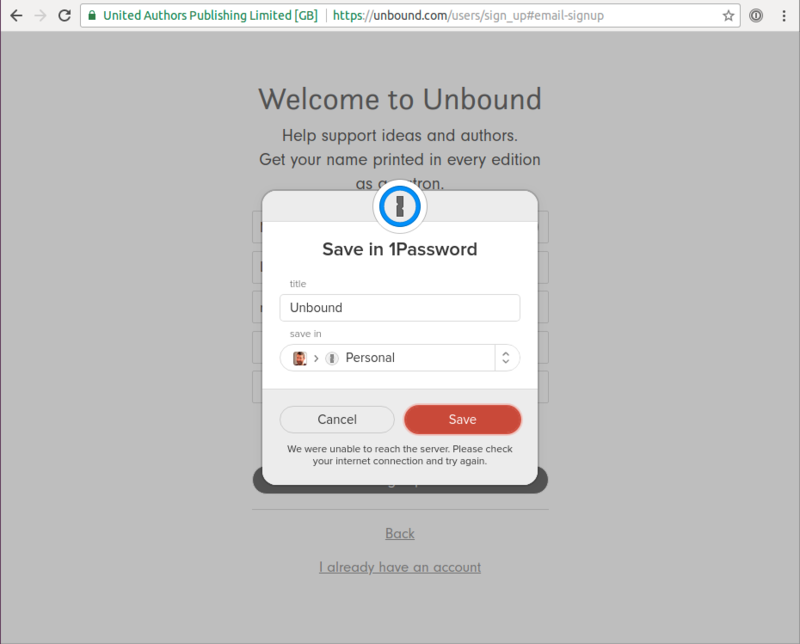 Do you use content blockers which are set to be more lenient at some sites, and 1Password X is ending up getting caught in the crossfire on others? I don't believe LittleSnitch could cause that, as it would probably be blocking all browser connections, but I may be wrong about that. Let me know what you find! Had this too for the first time saving a login. A reload (Developer Tools - Reload), filling in my master password and trying to save again worked. Using 1Password X Beta en latest Chrome. @yokk: That's interesting. And it's working for you now after reloading? Did it just happen the once? @brenty: It happened just once since I'm using 1Password X (since a few days). I have 'automatically lock 1Password X' off, and maybe it is some sort of time-out? 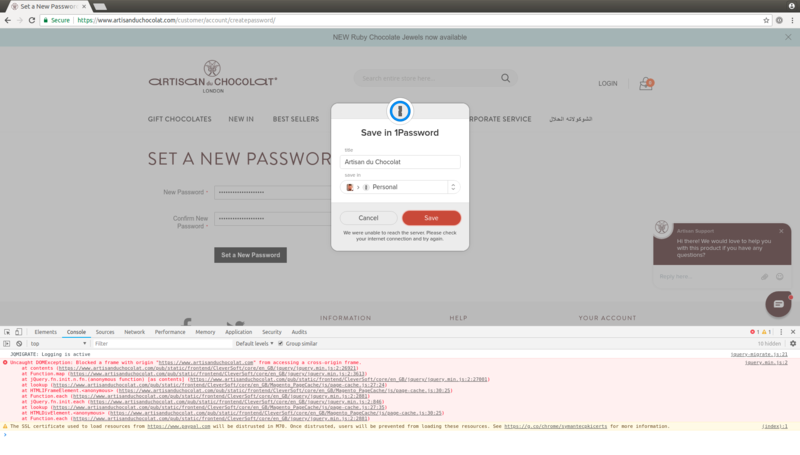 The next time I get the error I will check if I can save a login from a different website or not. @yokk: Sounds good. 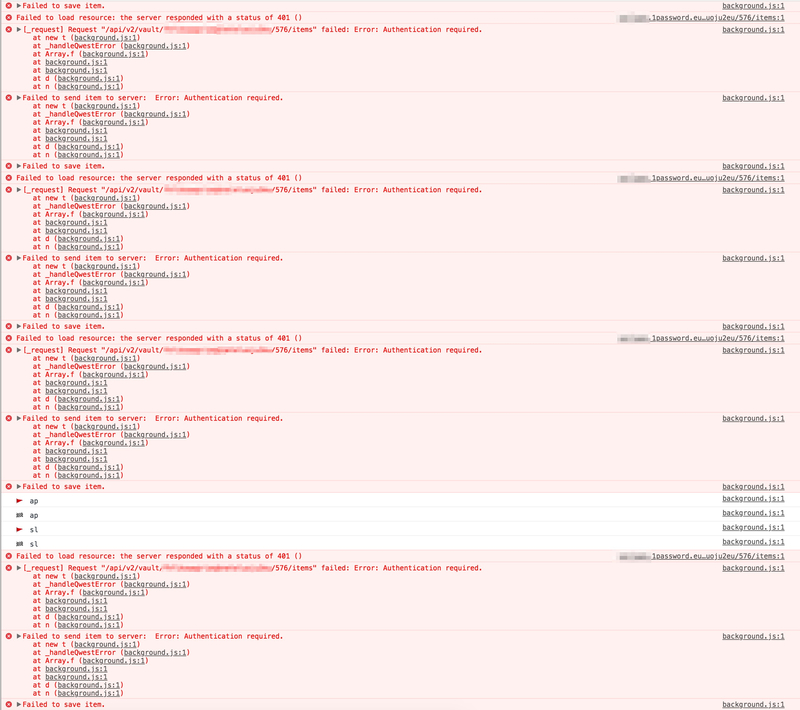 Also see if there's a more detailed message in Chrome's console if you can. Very odd. I get this all the time also. I am still on my trial period and this is not convincing me to get the paid version. Thanks for letting us know, @eizion. I'm sorry for the trouble. In general we're a little over zealous with the "network connection" error message as we use it as a catch all, so it ends up being used in some error situations where it really shouldn't. We'll get that fixed up but in the meantime I suspect for many users this error is related to permissions. This is usually related to trying to save a login to a vault where you only have Read-only access but in the screenshots above I see Private / Personal vaults being used, so this can't be the cause in those cases. My second thought is perhaps the account is frozen, thereby making all your items read-only. In other words, for some users this error would be showing because their trial has expired. A new Developer Tools window should appear and you can then click on the Console tab. If there are any errors they will be shown there. Hopefully by viewing these we'll be able to find the root cause of this issue. 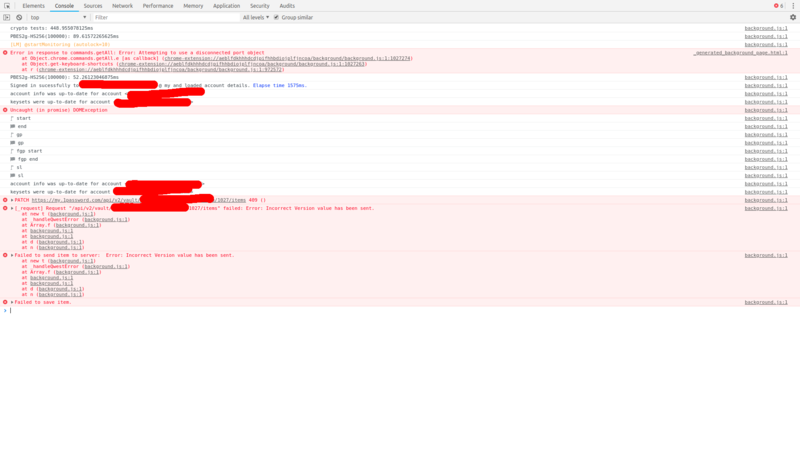 @dteare I will make sure I grab & send a log if I see the error again, thanks! (Some fun errors from Instagram's signup page...) Hopefully that helps. Here is the log from the background page, hope it's useful. By the way, I am using uBlock and Ghostery withing my Chrome. Is that a problem?? Thanks for the error reports, everyone. They were incredibly helpful. We found the root cause of this issue and addressed it in the 1.7.2 official release, as well as the 1.8.2 beta. Please give it a go and let us know if you see this error again. Thanks again for all your help tracking down this issue! Hi, I'm still experiencing the same issue when trying to add a new login using 1Password X despite upgrading Chrome and the extension. To test, I disabled all browser extensions except 1Password X to isolate the issue. I don't believe I have any services running that would impact the network. I have not set "automatically lock 1Password X" to disabled. Any help? @mwongj: It looks like the sign-in domain for your account has changed but wasn't updated in 1Password X. Could you please try removing your 1Password account from the 1Password X settings page and adding it back? Sure thing! Thanks for sharing your logs so I can make sure that issue doesn't happen to others. Have a great week and let us know if anything else comes up. I've also noticed that in this instance, the Chrome extension doesn't seem to be syncing with your servers either - modifications I make on https://my.1password.com/ aren't visible in the Chrome extension. Please can you suggest some way to provide you with better diagnostics or logging so you can fix this? Almost as frustrating as the problem itself is that no one's been able to suggest a better way of helping you to track down the problem. (e.g. if you want me to rule out connecting to the servers at all being a problem, let me know which it should be contacting and I'm happy to see whether that's happening with tcpdump, or anything else you suggest.) Or is there some logging hidden somewhere in the extension's interface that I can get at? Hmmm.....I swore I fixed this. Looks like we have more than one issue here. 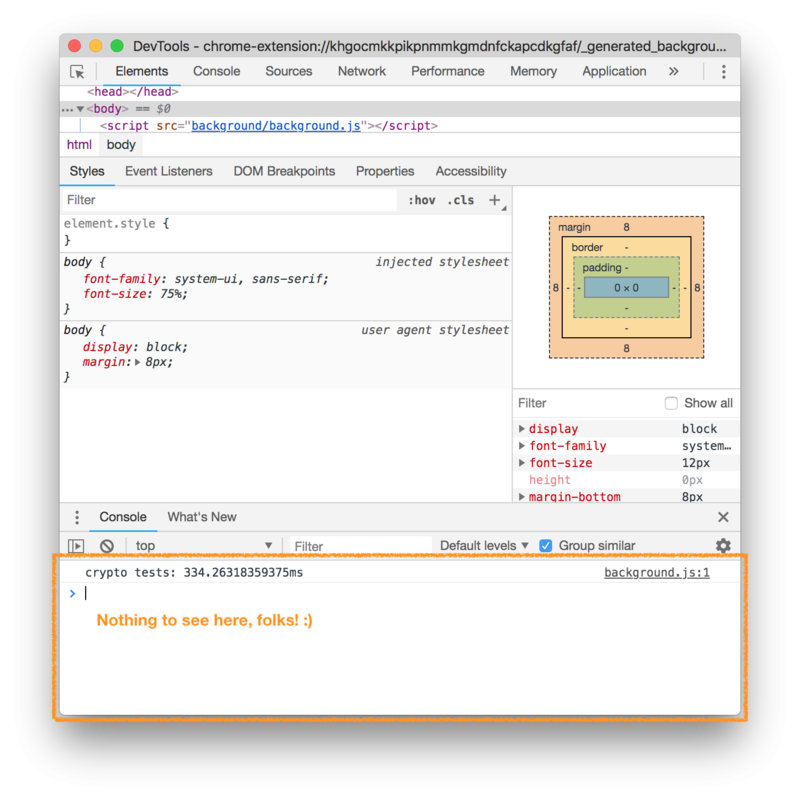 A new Developer Tools window should appear and you can then click on the Console tab. If there are any errors they will be shown there. One other thing I'm wondering about: have you changed your 2FA settings, Secret Key, or Master Password recently? It's a shot in the dark but we may have an issue related to that so I thought I'd ask. 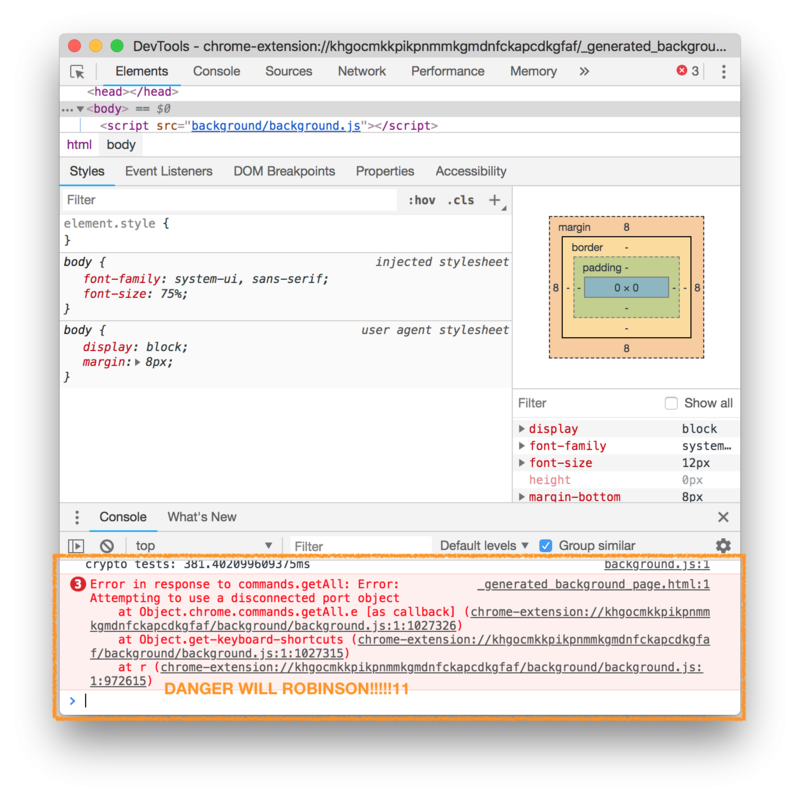 Hi @dteare - first of all, I should say sorry for my last comment, since when reading the more recent updates to this thread, I had completely missed you explaining how to view the background page errors. I haven't changed my 2FA settings, secret key or master password. For this test, I clicked the "Use suggested password" option on a "change password" page, which pops up the "Save New Login" box. On clicking that, I get the usual "We were unable to reach the server." error. 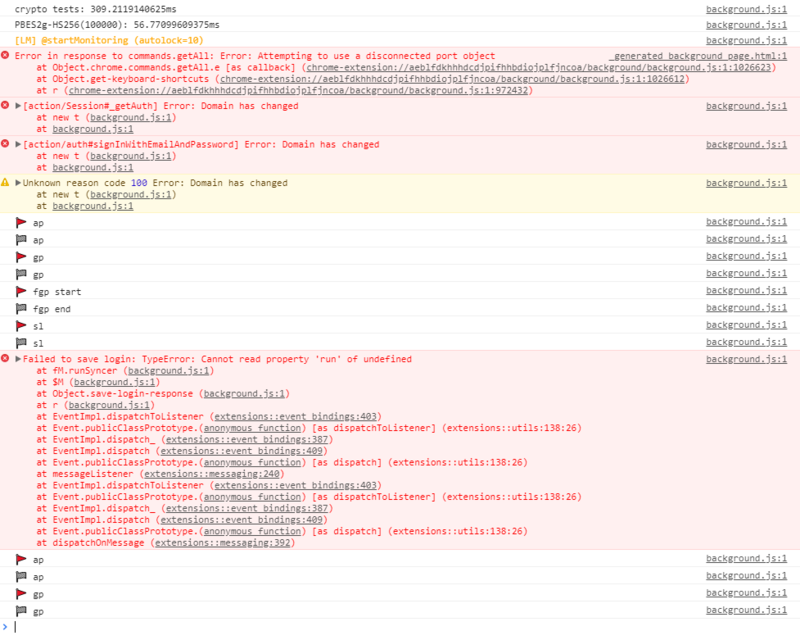 In the background page console, there are some helpful looking errors, however! Namely: "Error: Incorrect Version value has been sent." I've attached a screenshot of that console, but I've blanked out some IDs that look like they might be personally identifying (e.g. email address, account ID). Please let me know if you'd like any more details, e.g. details of what's being sent in that request, since I'm not sure what from there should be kept private... I hope this is of some help, anyway. Looking at the errors here I think I know what's happening. I wish I knew why it's happening, but alas I'm going to need to dig deeper before I understand the why. I'm pretty sure that removing 1Password X and reinstalling it will fix this problem for you. I say this as it appears the syncing is not finishing completely and so when we go upload the item, we get rejected by the server as we're trying to make edits to the previous version of the item. Please try reinstalling 1Password X and let us know how it turns out.